Wednesday is the Opening Day of Spring Training. “Lent” is the Dutch and archaic English word for “Spring.” It came to refer to the season of spiritual “training” in the Christian year – hence, “Spring Training.” Play along with the analogy for a moment: Spring Training is where baseball players find out what they’ve got, where they learn and experiment with new skills, and where they figure out what they still need to hone for the regular season. 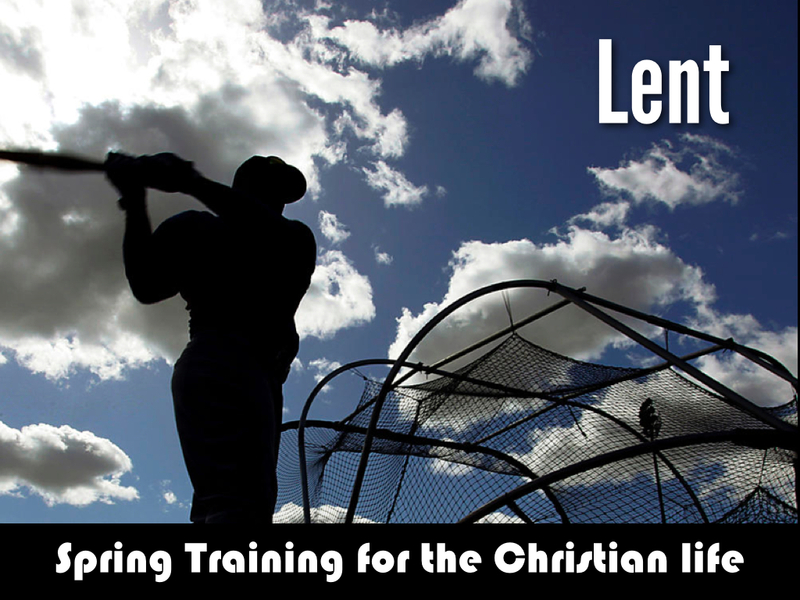 Lent is the Church’s 40-day preparation for the regular season-the rest of life. And Opening Day, Ash Wednesday, is this week. Lent is a spiritual practice. Spiritual practices, or disciplines prepare and free us, much the way a great hitter’s thousands of swings, day in and day out, give him the freedom to hit pitches a lesser batter wouldn’t dare swing at, or the way the apostle John’s years in prayer wore out his knees but shaped him into the apostle of love. Lenten practices, over time, produce a freedom, and open us for the grace of God to more fully shape and captivate us. Contrary to a common opinion, Ash Wednesday and Lent are not about spiritual brownie points, merit-earning, or God impressing. Neither is it a way to make belated New Year’s resolutions – like dropping that last five pounds by cutting chocolate. No human is rendered worthy through repentance. Worry not, theological policeman: ashes, penitence, and Lenten disciplines are not works to earn God’s forgiveness. Forgiveness is earned though…just not by us. Forgiveness was earned by God at God’s initiation and God’s expense. We ARE forgiven because we WERE forgiven – on Calvary. Our forgiveness was proven three days later as a risen Lord walked victorious from the mouth of an empty tomb. That is why we are penitent – We have seen the great acts of God on humanity’s behalf. Our efforts are merely “training” in walking in gratitude of that gift. And so, in anticipation of celebrating anew the Easter event, we spend 40 days in Lenten practices, either giving up something we enjoy and/or taking on a new spiritual activity. Self-denial and self-discipline remind us of the greatness of our God and Savior. If you attend an Ash Wednesday service (you can find one at any Episcopal/Anglican or Roman Catholic Church) you will listen to Holy Scriptures calling us to repentance, have ashes imposed on your forehead to remind you, “remember you are dust and to dust you shall return” (Gen 3:19), and then we will go forward, empty handed, to receive the Lord’s Supper. The tradition of the ashes began as early as the 4th century, associated with a 40 day fast. Most likely this fast was the Lenten fast, but the evidence is spotty. It is clear that by the end of the 10th century it was a longstanding custom in Western Europe for the faithful to receive ashes on the first day of the Lenten fast. In 1091, Pope Urban II extended the tradition to the church in Rome. The Scripture readings point us toward our need for humility before God. We will read from the prophet Joel who reminds us that God is rightfully upset at our forgetfulness of both him and the least of his creatures. Joel implores us to, “Rend your hearts and not your garments.” – It is an internal brokenness God desires, for it is through brokenness that God’s love seeps through the cracks of our hard outer shells of self-reliance and idolatry and transforms us from the inside out. We will also read 2nd Corinthians 5:20b-6:10, in which Paul entreats us “be reconciled to God. For our sake he made him to be sin who knew no sin, so that in him we might become the righteousness of God.” – A righteousness not from us: It is “of God.” This passage begins with the completion of a sentence in which Paul is exhorting the Church to be “Christ’s Ambassadors,” bearers of the message of reconciliation. Did the gravity of that sink in? The holy Lord of all creation…the God whom the Israelites in the wilderness trembled at a distance as he hid his holiness in a terrifying cloud atop a mountain…the God whose moral perfection and purity was such that Moses could only see God’s back as he passed by…the God whose ark representing his presence couldn’t be touched, even in its defense, without the offender being struck down…THAT holy God makes us to be THAT righteousness in his sight. …Even more, that same God calls us to the high and holy calling of reconciling other broken humans to himself. So the reason Christians are penitent at Lent is that our spiritual life isn’t just a nice experience for ourselves. We acknowledge a calling far beyond human reason or human capacity. Our hope is that, by being increased in love and mercy as we pursue Christ, we would be a help to others in their journey toward the Savior. Lent is an opportunity for God to call us deeper into himself and his high and holy purpose of pointing our friends, families, neighbors, and co-workers to the great mercy of the Triune One. And so we will go to church on Ash Wednesday to be marked outwardly with ashes as we remind ourselves inwardly that, “We are dust.” But we are redeemed dust. Grateful dust. Dust with a purpose. Come find out what you’ve got. Learn and experiment with new skills. Figure out what you still need to hone. Every once in a while a professional athlete, for one reason or another misses Spring Training. It almost always shows. Would you like to be more serious about your spiritual “game”? Ash Wednesday is a great place to start. I love the analogy. Facebook etc has seemed to be a means by which we have forgotten what lent is about…rather than true fasting (where we don’t announce it – Matt 6:17-18) it really has become the new year’s resolution for Christians to lose weight or get into shape. Thank you for your thoughts on Ash Wednesday and church in general. Your winsome writing and thoughtful analysis have blessed me. Thank you, Emily. Wishes for a Holy Lent. Thankyou, N.T.Wright. I needed HOPE. Hope to develop spiritual disciplines. Thankful for a patient and merciful God. I need Him. HELP ME, LORD.